"Child Care Deserts" impacting thousands of kids. INDIANAPOLIS—"Child care deserts" is a new term to describe the growing need for quality day care. Child advocates say nearly half the children in Indiana live in areas without enough child care facilities. Maureen Weber is president of Early Learning Indiana, which operates nine day cares in Central Indiana. There are about 500,000 Indiana children under the age of five and about 1,000 are cared for at Early Learning Indiana. "We have really tried to stay in those areas where there are high populations of children and a lot of children who otherwise wouldn't have access to high-quality care." Weber says the lack of child care exists in all kinds of communities -- it is not just an urban problem or a rural one. 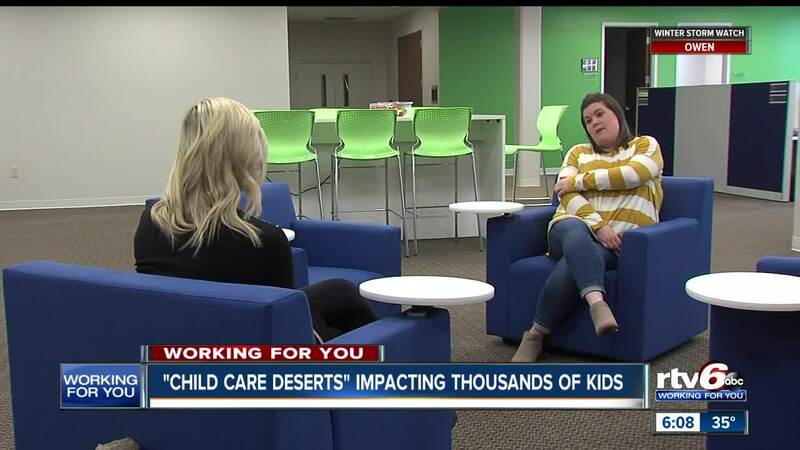 On the RTV6 website, https://www.theindychannel.com/, is a map showing where child care "deserts" exist. There are also resources for parents on where to find child care.